I'm sure than in one of my previous lives I must have been a desperate housewife and my karma now refuses to repeat that life. When it comes to cleaning I am not the right person to ask an advice to... I love to work from home and live in my cozy and happily decorated 35 square meters (yeah, I live in the country but my house is as big as a NYC flat) but I just hate to clean. I refused to pack my sewing machine yet and the half-finished Marie Skirt is lying on the ironing board abandoned... I really wish I can finish it for Easter!!! Any advice when it comes to cleaning in a good mood? I know some of you out there has a secret... please share!!!!!!!!!! How I love snail mail! Last week I won Biancifiore's giveaway... it was my first time winning and I was super excited to receive my lovely gifts! Biancifiore is a queen of recycling things and always comes up with precious crafts!!!! 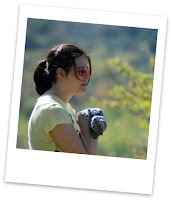 Her blog is only in Italian but pictures speak for themselves so, please go and say hello to her; if you have small kids you'll find tons of projects to make with your little ones. Now back on my prizes... I won not just one but two sewing books!!!!!! Sewing for dummies (in Italian, finally I won't need a dictionary near my sewing machine) and Baby Patchwork. I do not have children but the art of quilting is something I find really interesting, so I will read it carefully and then give it a go! And there was also a beautiful handmade necklace... its colours are perfect for Spring!!! But the biggest prize of all is a hand-made sewing kit!!!! Biancifiore herself made it recycling an egg carton! And inside there's all I need: threads, needles, pins, buttons and a very little pair of scissors! It's way too cute!!!!!! I'm in love! Thanks Biancifiore for this awesome giveaway!!! I loved it! Now off to my brand new books, I'm going to study hard... I can see new creations coming!!! I know this is a crafty blog but today I want to share a link with you. It deals with our planet and with what we eat every day. A photographer and his wife went around the globe getting picture of the typical weekly grocery shopping in random families: US, Italy, France, Bhutan, India, China and so on. The pictures are amazing and you can't watch them without reflecting on the disparity that reigns on Earth. For some people grocery shopping is packaging, colours and brands, for others it barely is a handful of rice. Please follow the links and watch them, the time spent in looking at the images is really worth it. Please help spread them too, it's important that every single soul on this Planet reflects on the topic aroused by these pictures. Blogging can help us make the world a little better, that's why I do it. Glimpses of Spring... from my garden! Happy Spring to everyone! I know I am early because it officially starts tomorrow but I spent all day outside gardening gardening gardening!!! Awesome!!!! These are a few details too beautiful not to be pictured (and posted)! I hope the weather is warmer wherever you are!!!! Have a great weekend! 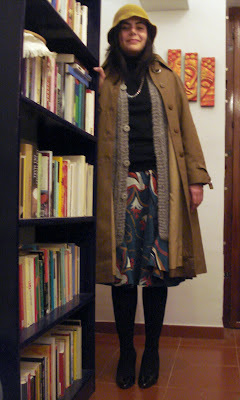 It took me more than one week but in the end I finally managed to post something on Wardrobe Refashion. 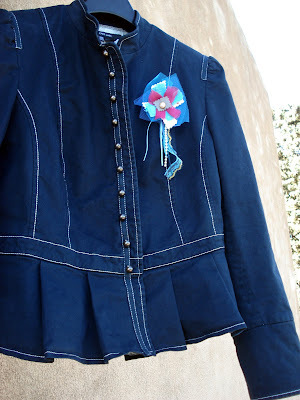 I knew it was going to be tough... properly speaking I haven't done a refashion like those you can see on the blog... I just overdyed a white jacket that, because of its colour, hadn't been worn once in the last two years. I bought it on sale at Zara in 2006 for less than 20€. I wore it a few times to go to work but when I lived in Milan boyfriend and I used to ride a scooter which was not the best for a white jacket. Last year, when we moved to the Sicilian countryside white became even more difficult to wear: our car is used both for going out and transporting country things, when I get home my dog is so happy to see me that he loves to put his usually muddy paws on my belly... So the white jacket went at the bottom of my wardrobe and lied there almost abandoned. In the end, I decided to overdye it. I wanted it to be as black as the night and I also wanted to put a few lacey details in order to give it a more military look. I had a vintage triangular lace that was perfect to put on the shoulders as a fake flash. Ok, so no lacey black flashes on shoulders and black sequins... I can't believe something so simple went wrong. 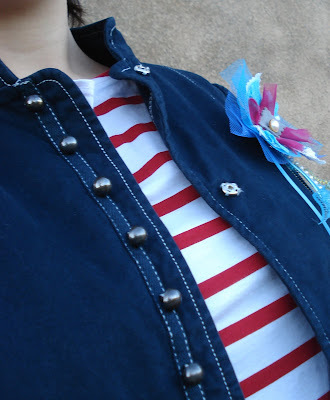 So, after thinking of handstitching all the white thread in dark blue, putting a vintage lace on the collar and blue sequins on the shoulders (the last two can still come though), I went for simplicity and added this hand-made brooch that I bought in Madrid in 2006. It looks good to me! Plus, boyfriend said that it looks like a sailor garment. I hadn't thought of that! I immediately went to my closet and wore the jacket on top of my striped tee... now I just have to say goodbye to this flu and welcome Spring!!! Spring seems finally to be here but I'm stuck inside with a cough and I don't feel like crafting. I just feel drowsy and stayed mainly on the couch with my netbook on the lap, surfing the internet and procrastinating. However, in these last two days of browsing I found a few real gems... the one I love to share with you is Sashiko Embroidery. It is a Japanese running stitch used to reinforce old and thorn clothes. Fishermen were poor and couldn't buy new garments due to the expensiveness of cotton thread. Farmers also used it to quilt their outer jackets to stay warmer in winter. geometric patterns. As all things Japanese, it is mostly a matter of concentration and form. The process will bring you, through a rigid process of perfection, to a neat and geometric result. Did you know about Sashiko or is it new for you? Have you ever tried it? I haven't done it yet but can't wait.... a placemat set is on its way!!!! Finally I am able to share with you my first embroidery assignment. I'm proud of my work as I had never embroidered anything before, except for cross-stitch and tapestry. I worked with stem stitch, french knots, split stitch and chain stitch. I added feathers on the hat because I wanted to give a '30s feel... can you feel it too? I want to thank you all girls for the lovely comments you left on my outfit post yesterday!!!! That was great for my self-confidence! You rock girls! I'm finally back home after experiencing another taste of winter in Switzerland... it was actually snowing on March 9th... where's Spring? Here in Sicily the weather is not at all better... it's been raining really hard for a few days now... that means that all my garden projects went at the bottom of my to-do list. I would love to say that this will mean a lot of time to craft but power went out in the small house I'm now using as craft room due to the rain and we still have to figure out why. I will crawl on my couch with my embroidery assignment and try to finish it! Yesterday night we went to see Alice in Wonderland in 3-D and it was absolutely amazing! I never had the chance to see a movie in 3-D so I felt like a kid in a candy store. The colours, the plants and Alice's dresses were magnificent!!! They would have looked amazing on a red carpet! Oh... and what about the Mad Hatter's laboratory? Ribbons, fabric, feathers scattered everywhere, that was really the craft room of my dreams!!!! Below it's a picture of what I wore. Even if this is not a fashion blog and will not become one in the future (as I don't have the confidence and don't feel too stylish), I felt so great wearing that clothes that I decided to share them with you. I felt pretty, sustainably stylish (most of the garments are vintage hand-me downs) and in some way it was my tribute to Alice and her beautiful Wonderland. Crocheted hat - hand-made by grandma V.
Raincot - vintage, was grandma's E.
I love it even if I feel it is too country... ops, I was just forgetting that I live in the country therefore it's appropriate! What do you think? After long hours spent thinking... after nights spent awake trying to figure out what to do... I took a deep breath and got myself in another trouble.... I entered the magical world of Wardrobe Refashion (button on the right)... for the next two months I pledged that instead of buying new clothes, I will refashion what I thrift, what I already own and build new items from my huge fabric stash! I'm not a goddess when it comes to sewing... hence the name of my blog... I couldn't even understand in the Marie skirt sew-along that one small piece was to be used for the bottom of the skirt... but you learn only from your mistakes and only making things, so what could be best than trying to built up a spring/summer wardrobe from scratch? It's a huge challenge and I'm really scared and excited at the thought!!!! Did any of you took the pledge in the past? Any advice? p.s. in order to start in the best possible way, I went out and bought new bobbins for my sewing machine, a gauge, some feathers (for my embroidery class), tracing paper for patterns, fabric and a small rotary cutter! Believe me... I feel like having bought a pair of Marc Jacobs flats... I'm so proud of my shopping!!!! This is how my crafty space looks like tonight after I ended the second dog bed for my mom. I know, it's a tremendous mess and while I shouldn't be posting this, I also think that it shows all the effort and passion I put in my work today. Fabric swatches are everywhere, thread spools are rolling on the floor and my favourite scissors have disappeared. Nonetheless, it was fun to treasure hunt in my own space. Weekend was spent working in the outdoors, tasting Spring! As we hadn't worked enough the day before, on Sunday we went to Cava d'Ispica, a natural canyon some 20km away from our home, and helped the great guys of "Kalura", a group that wants to spread the passion of walking and trekking, in cleaning a path. We built stairs with wood and stones in a steep slope. The weather was beautiful and the company amazing, we went home tired but happy. Plus the place is magical. Really. So, I had no time for crafting with my hands but in some spare time, I had the chance to take some inspiration from the web. On Saturday I received via email the first assignment of my embroidery course. It's a huge challenge as I am only able to cross-stitch. We will experiment the basic of mixed media embroidery using as pattern a feminine silhouette. This week is all about "paint and stitch", experimenting watercolors and embroidery. I am quite scared in thinking to start this huge project but nonetheless I would love to find just five minutes to sit down with my threads and choose the right palette. The course is from the lovely Hand Embroidery Network which provides a lot of free tutorials on basic stitches. Through them I also found this beautiful website, more a network, called Colour Lovers, where you can browse through tons of palettes, patterns and colours. It's great to find some inspiration and, why not, some new and bold combinations. You can even create and download your personal colour scheme. I'm looking forward to finding the time for browsing it as it deserves. Any weekend inspiration or adventure you want to share?